100% pure, naturally cholesterol free vegetable oil, packed in an attractive plastic bottle with design ridges both at the top and the bottom. It is packed with a heavy aluminum safety seal inside the top to insure a tamper proof product. This is 100% soy bean. In a self-display box which allows product to be displayed immediately, simply by opening the front side flap. 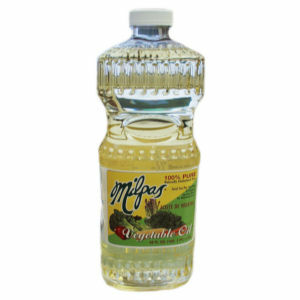 Milpas quality is always guaranteed.